Happy Birthday Troy n Nick! Tonight, Nick and I are celebrating our Birthdays together for the first time in a long time. His birthday is the 29th; mine on the 20th. We are having an informal gathering at the infamous Trailer Park in Chelsea. 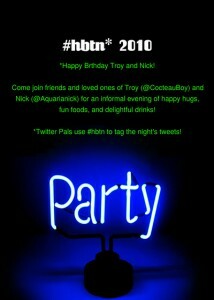 As part of the birthday celebration, and in conjunction with our lovely embrace of social networking and technology, we will be posting tweets, 12seconds, etc with the “hashtag” #hbtn (for happy birthday troy nick) Below is the live feed from tonight’s events, if you feel like joining us in spirit, remotely! If you want your tweet to show up in this thread, just include #hbtn and it will feed directly here, LIVE!